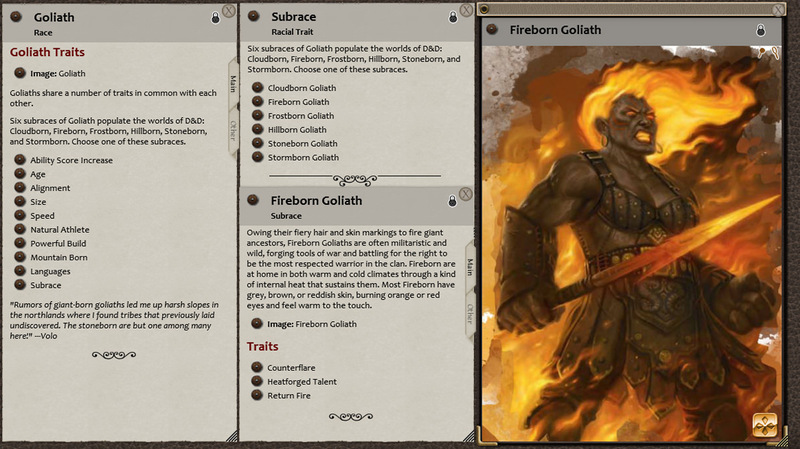 Announcing Volo's Complete Subrace Handbook, which contains an incredible 50 subraces, 30 racial variants, and 32 racial feats for your 5e D&D adventures, now for Fantasy Grounds! Are you looking for new subraces to compliment your favorite D&D races? You are in luck, as this supplement contains more than enough options to spice up your 5E D&D games, created for use in the Fantasy Grounds virtual tabletop. This subrace guide is written by Volo's own hand! Included within this supplement are 50 subraces (39 new, 11 revised). 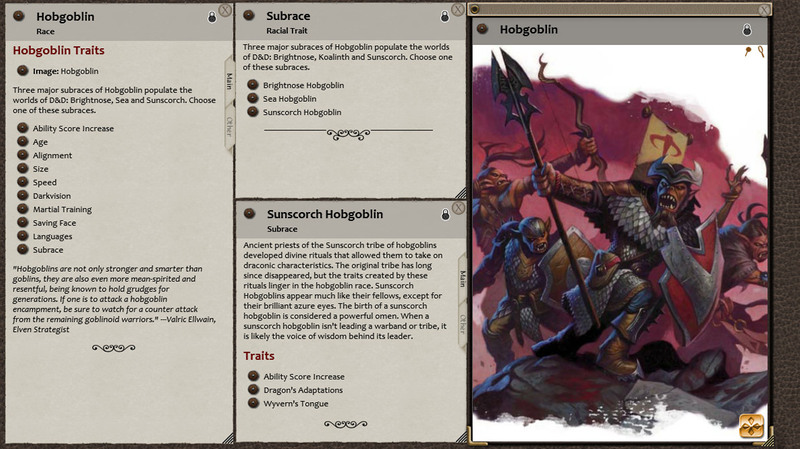 Also, 30 of the officially published subraces in source material (PHB, SCAG, VGtM) have been edited with variants that you may enjoy more than their published counterparts. And finally, 32 racial feats have been created and included in this supplement for good measure! 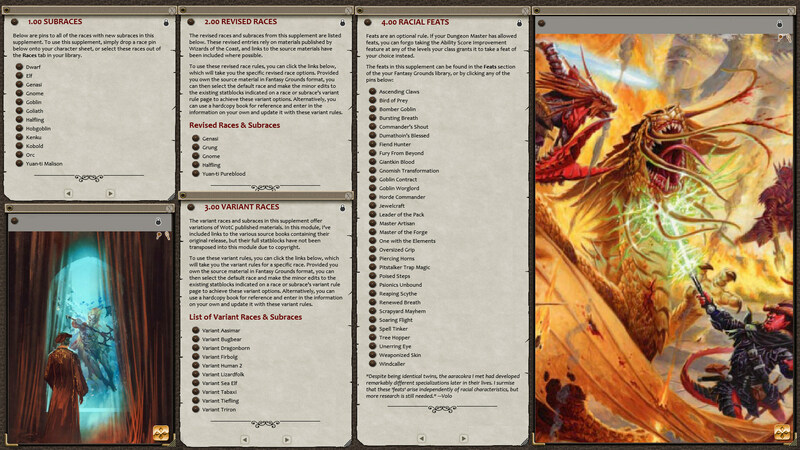 This Fantasy Grounds module allows players to easily drag & drop the 39 brand new race/subraces onto their character sheets in the same manner they would any officially published 5e race in this virtual tabletop. Also, instructions have been included illustrating how to incorporate the variant and revised subraces using the officially published races as a source, with pins linking to the required modules. It is recommended that player's purchasing this module own the Fantasy Grounds version of the 5E Player's Handbook, Volo's Guide to Monsters, and/or Sword Coast Adventures Guide, but they are not required. Note that these official publications are not needed in any form to use the 39 new subraces. You can click the link below to find the pay-what-you-want PDF version of this supplement. This is a risk-free way to see if this content is for you! If you enjoyed this product, please leave a review and feel free to check out my other Fantasy Grounds releases! Wondering if I'm doing something wrong. I added the downloaded module to the correct folder and I see some of the Volo's races but not all. Looking for Lizardfolk but I only see 10 races as drag and drop for player characters. What up? Only some of the races / subraces are drag and drop (39 total). The others are revised from official sources, so you would need to add the original and then make the edits as outlined in the race's story entry. I don't know why when I completed downloading it, the file EXT is a .MOB. When I converted it to a pdf, the file is still unreadable. Is there a reason for this or is this simply an error in the upload process?